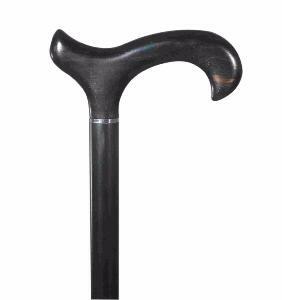 An extremely special, classic walking stick in sought-after ebony hardwood. The derby handle provides excellent support to the hand. The wood is very dense, giving the cane a heavy, substantial feel. The colour of the wood is predominantly black, although there are often rich orange-brown streaks, or 'figuring' in the wood grain pattern. Available in ladies', gentlemen's and extra-long sizes. Fitted with an elegant collar and discreet rubber ferrule. Ferrule diameter 16/19mm. Item weight approximately is 415g.